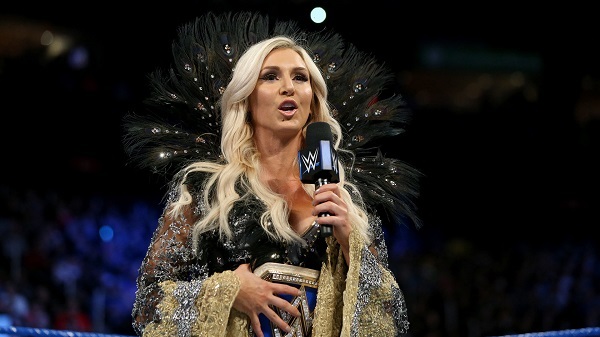 NZPWI had the opportunity to speak to SmackDown Women’s Champion Charlotte Flair earlier this week. Daughter of 16-time world champion and WWE Hall of Famer “Nature Boy” Ric Flair, Charlotte made her WWE debut in 2013. In little over four years, she has gone on to hold the Divas, Women’s, Raw Women’s and SmackDown Women’s Championships. Charlotte spoke to NZPWI’s David Dunn about the all-women’s Royal Rumble, New Zealand’s Dakota Kai, Christmas Day for the Flair Family, and more in this exclusive interview conducted Wednesday, December 20. David Dunn: WWE will hold an all-women’s Royal Rumble in January. Where were you when you first heard the news? Charlotte Flair: I was actually driving in the car—well, I wasn’t driving, I was a passenger—after White Plains [New York]. SmackDown had a live event, and I got a text from someone at social, a part of our company, that said, ‘Hey, have you responded to the news about the Royal Rumble?’ I was hoping it was going to happen but I had no idea when we were going to announce it, or that it was going to be announced this soon. It was like 11:15 at night. Then I was on Twitter and I was like, ‘Man, where have I been for the last 30 minutes?’ My Twitter was blowing up, it was crazy. I just feel now, with the announcement of the Royal Rumble in January, the women’s evolution is complete. Hell in a Cell, Money in the Bank, and now a Royal Rumble—women have done almost everything in WWE. Is there anything left for women to do to achieve equality with male WWE Superstars? To main event WrestleMania. But saying that though, WrestleMania 32 really felt that the three of us [Charlotte, Becky Lynch and Sasha Banks] were one of the main events. So, would going on last make you the only main event at WrestleMania? I don’t know, I guess that’s someone’s opinion, but to me I guess you’d have to say going on last at WrestleMania. But with the Royal Rumble, like you said, we’ve done everything now. There’s nothing that the men have done we haven’t. Do things feel historic at the time? Can you appreciate their significance in the moment? I get asked this question a lot. I think because I’m in it right now it’s very hard to take myself out of the bubble and realise how much it’s changing the women’s division and we are making history continuously. Because it’s go-go-go and on to the next. But I can tell you the feelings I have. For instance, the ladder match this Summer on SmackDown, it had never been done before. That’s why it’s called the first-ever women’s ladder match—you don’t know really how to feel. You don’t know what to expect. So not only are you competing in the first-ever in one of these events, it’s like you don’t know what to expect at all so I think it’s more being nervous and wanting to over deliver and show management that when you put us in situations that the men are used to being in, the pressure of just having to deliver… say Clash of Champions this past Sunday in Boston, I just kept thinking, ‘Wow, it’s only been a year since Sasha and I main evented Hell in a Cell‘ but then in my mind I’m going, ‘I wish I knew then what I know now as a performer.’ I want to go back and do it all over again, to make it that much better. It’s crazy. Dakota Kai represented New Zealand in the Mae Young Classic. Did you get a chance to see her when you were in Orlando for the tournament? To be honest, she was one of my favourites. She is everything that a babyface stands for. Her energy, her passion, her spunkiness—when you see Dakota that’s who she is. She’s one of my favourites and I think she’s going to be a huge star one day, no doubt in my mind. Ronda Rousey was also at the Mae Young Classic, and seemed to challenge you. If it were up to you, where could we expect to see that match? If it was up to me? I would face her at WrestleMania. It’s the biggest show of the year, and that feels like a WrestleMania moment. When you first started training to become a WWE Superstar, did it help or hinder you to be Ric Flair’s daughter? It’s definitely a mixed blessing. That’s such a dynamic question. Even to this day—after accomplishing so many things—I still feel I always have to prove myself, or I have to work twice as hard. Maybe there’s a part of me that always feels like I have to prove I belong here, and that it’s not just because I’m his daughter. That definitely keeps me on my toes and keeps me hungry. I’m naturally a very competitive person. I played sports my entire life, so no matter whether it was volleyball or cheerleading or gymnastics I always wanted to be the best or team captain. When I first started in NXT and I was around all of these women who travelled all over the world and worked their butts off to be a part of this company, who were further ahead of me, I was like, ‘Oh man, I’ve gotta catch up!’ I’m talking about Becky, Sasha, and Bayley—even Emma and Paige at the time. So, I don’t know. It’s both. Part of me is very competitive and the other part is like, I feel I always have to prove people wrong. Did you get to experience wrestling as a fan when you were younger, or was it always just your dad’s job, your dad’s co-workers, etcetera? I was my dad’s biggest fan but it was more just because this is what my dad does and this is his job. Every time we went to a show and his music would hit I would stand up—that feeling of just being so proud and going, ‘That’s my dad!’ I always thought his music was the coolest, and his robe. I guess you could say I looked at him and I was his fan but in terms of the entire product I didn’t fall in love with the industry until I started. Ric Flair seems to transcend pro-wrestling. What’s it like sharing your dad with the world as a pop-culture icon? I’ve always shared him. You know what makes me happy? Because he has turned into a pop culture icon, I love nothing more than when I get texts from him in the morning of pictures of these guys in the music industry who look up to him. For instance, someone just recently made a huge gold chain of him and my dad texted me … like, ‘Hey, isn’t this the coolest thing ever?’ He just recently did a rap video and he was sending me the links before they went live. He’s so proud of it. Because he’s adored by pop culture or people outside of our industry, I know it makes him feel good. To me it’s not sharing him, it’s getting to have the opportunity to let the rest of the world get to know him and see him and adore him the way I do. What was it like when he surprised you on SmackDown after your women’s title win? It was just a special night being in Charlotte. I had so many friends and family there, and the emotion of being in my hometown and being able to cut a promo at the end… it was the first time my dad was back on WWE television since he was sick, so it just felt right. It was one of those moments you could never rewrite, or write to have come across so well. You could feel it, being in Charlotte. Raw’s going to be Chicago for Christmas next week. What are your plans? What’s Christmas like for the Flair family? I will be flying to Chicago Christmas Day. So I will… I guess celebrate that morning with my brother and his kids. The holidays are really special, it’s just trying to get around and see everyone: my sister and her family, my brother and his family, my dad and his, my mom and hers. You recently released a book, Second Nature. Obviously you’re very good at telling a story within the ring, but what was the process like of putting pen to paper and telling your story? It’s way more difficult than wrestling. It actually took almost two years of journaling. The hard part wasn’t necessarily telling stories. It was just opening up and being okay sharing my life because it’s very easy to hide behind Charlotte. The character is very… she’s not relatable. She never comes across vulnerable. It was me lifting the curtain and letting people in on my life and knowing that things were messy. Maybe it’s because of my obsession with perfection within this industry—that was the hard part was knowing, ‘Oh my gosh, I’m gonna share my life’. The reason I decided to in the end was because I just one day changed my path and ended up in WWE, and it was a very unlikely journey. I found something that I became very passionate about and it changed my life. It’s almost like, the better my professional life gets the better my personal life gets. I wanted people to know they’re not alone and that girl they see on TV on Raw or SmackDown or pay-per-views in WWE is someone that’s probably gone through something that they’ve been through as well, so they’re not alone.